Blood thinners and dental treatment - Bassam Michiel, D.D.S. Your medical doctor might have you on a blood thinner for various reasons. Blood thinners can be used to prevent blood clots from forming or help treat heart disease. It’s important to tell your dentist about all medications you’re taking, even a baby Aspirin! Even a low dose 81 mg Aspirin taken daily can cause prolonged bleeding time. I know what you’re thinking, “So what’s the big deal!? 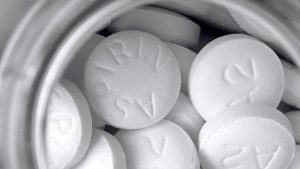 It’s only a baby Aspirin.” A small surgical procedure like having one to two teeth removed is almost always manageable in terms of controlling bleeding. Some of the stronger blood thinner medications are usually accompanied by blood testing to monitor bleeding time. Your dentist might request a copy of the latest blood test results and/or consult with your medical doctor on their recommendations. Every patient and how they react to their medications presents a unique situation and should be handled on an individual, case by case, basis. Aside from surgical procedures, there are challenges that are encountered by your dentist while doing a simple filling or a crown. Blood thinners in these situations don’t cause any concern for prolonged bleeding and total blood volume lost, but, today’s white fillings and crown cements are very technique sensitive and don’t work well in areas where there is moisture, of any kind! 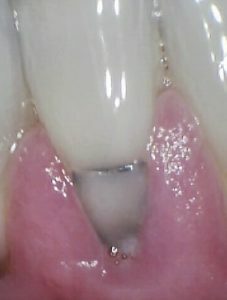 Moisture contamination when a filling was placed causing dark lines over time around the edges of the filling. With these restorative procedures, keeping the area and teeth dry from saliva and blood is of utmost importance in order to get a good result that will last. When I see a tooth that has a filling with a dark line around its edges, I know that keeping the area dry was a challenge during that appointment. If you have fillings that look like this, it’s time to get them replaced.